Summary: The Neuroform stent is a self-expanding nitinol stent designed for use in wide-necked intracranial aneurysms. Heating and imaging artifacts were evaluated by using a porcine carotid artery aneurysm model in a 3T MR system. A suspended Neuroform stent was tested for deflection. No heating was measured, and no evidence of deflection of the stent was found. Imaging artifacts were minimal. MR imaging in patients with Neuroform stent-treated aneurysms is safe and feasible. The Neuroform (Boston Scientific Corporation, Natick, MA) stent is a self-expanding nitinol stent designed to assist the endovascular placement of detachable coils in wide-necked intracranial aneurysms (1, 2). MR imaging is often desirable after treatment in some patients with intracranial aneurysms, both for evaluation of acute postprocedural neurologic events and as a means of surveillance for aneurysm recurrence (3, 4). The purpose of this study was to determine the safety of the Neuroform stent in a high-field-strength MR system. The methods used in this study to assess heating and deflection in the 3T MR environment are more completely described in a previously published report investigating detachable platinum coils (5). They are consistent with the methods used in other published studies (6–9). One section of a porcine carotid artery, approximately 3 cm in length, was obtained post mortem from an unrelated protocol performed under animal care committee approval. The artery had been used for an experimental aneurysm model. A venous pouch aneurysm had been created on the day of sacrifice and had been filled with detachable platinum coils (Matrix coils, Boston Scientific). After sacrifice of the animal, the vessel was removed en bloc and a 4 × 30 mm Neuroform stent was placed within the vessel, bridging the neck of the single coiled aneurysm. The segment was then placed in a capped 10-mL syringe filled with saline. Temperatures were recorded with two simultaneous probes in real time by using an MR compatible in situ, fiberoptic temperature sensing device (Luxtron model 755 multichanel fluoroptic thermometer, Luxtron Corp., Santa Clara, CA) sensitive to 0.1°C. The probes were placed in two different syringes: 1) within a stented artery at the level of the coil mass and 2) within a control syringe filled with saline. Heating experiments were conducted at five static points ranging from 88 cm outside the portal, to 75 cm within the bore at the imaging center. At least four temperature measurements were made for each probe at each position. Six measurements were also obtained during movement into and out of the bore at the same points, as the table was driven in and out of the magnet for a total of four complete cycles. Temperature measurements were obtained during two imaging sequences: a turbo spin-echo (TR/TE, 3000/98 ms; flip angle, 180°; section thickness, 5 mm; acquisition, 1; field of view [FOV], 200; duration, 29 minutes) and a T1 spin-echo sequence (TR/TE, 224/9.8; flip angle, 90°; section thickness, 5 mm; acquisitions, 20; sections, 6; gap, 0; FOV, 220; duration, 21 minutes). The model and the control were placed in the center of the imaging volume and surrounded by five 200-mL saline intravenous fluid bags to achieve the specific absorption rate (SAR) limit of 3.2 W/kg for the human head. At least 20 temperature measurements were recorded for each probe during each imaging sequence. A bare 3.5 × 30 mm Neuroform stent was suspended from a thread to allow deflection in the direction of the most rapidly increasing field or highest gradient, while the angle formed from the vertical direction was measured. Attractive forces were measured at numerous static points in the X, Y, and Z planes, where X is the left-to-right horizontal direction in the bore, Y is the vertical distance from the top to the bottom of the bore, and Z is the distance from the portal outside the bore or distance from the portal into the bore and imaging volume. For measurements along the Z plane, X=0 and Y=0 and vice versa for measurements along the X plane. Measurements of deflection were taken at 1- and 10-cm increments along the X and Z planes. The Z plane was measured not only outside the bore and at the portal, but also inside the bore. Visualization of deflections in the Z direction when X and Y are 0 were monitored by using a previously created apparatus (5). The stent was observed for deflection for 30 seconds to 1 minute at each position during static measurements and imaging sequences. Spin-echo T1-weighted: TR/TE, 224/9.8 ms; flip angle, 90°; acquisitions, 20; section thickness, 5.0 mm. Gradient echo: TR/TE, 100/10 ms; flip angle, 25°; acquisitions, 1; section thickness, 5.0 mm. Field Mapping Sequence: TR/TE, 300/100; flip angle, 90°; acquisitions, 1; section thickness, 5.0 mm. Images were visually inspected for subjective evidence of distortion of length or width, as well as for changes in signal intensity within or near the coil mass. No heating was encountered at any point in the static magnetic field within or surrounding the MR system. Temperatures decreased when the model was moved from the equilibrium point at the edge of the MR suite to positions within the magnetic field along the bore of the magnet. No heating was measured in the stented artery or control syringe during the 30 minutes of continuous turbo spin-echo imaging. A mild increase of less than 0.2°C occurred in both syringes over 21 minutes of maximum radio-frequency energy deposition at the SAR limit of 3.2 W/kg (Fig 1). Slight increase in temperature for stent aneurysm model and control during prolonged (21 minutes), maximal SAR (radio-frequency energy of 3.2 W/kg) imaging sequence. A similar temperature increase of less than 0.2°C can be seen in the stented artery (solid black circles) and control saline (open black circles). Deflection of the stent from the vertical position was not encountered at any position in the X, Y, or Z directions. In addition, no deflection was observed during movement into and out of the imager. Subjectively, no visible torque was exerted in the models while suspended from a string, at any point in the experiment. No measurable forces could be demonstrated acting on the stent, which indicates a lack of ferromagnetic or paramagnetic properties. The stent and coil mass within the syringe are shown in Figure 2A. The coil mass caused more susceptibility artifact than the stent (Fig 2B). Field mapping sequences failed to demonstrate any visible alterations in field homogeneity caused by the stent (Fig 2C). Images of a stented and coiled arterial segment suspended in a saline and gadolinium solution within a 10-mL syringe. A spin-echo T1-weighted image (A) shows the syringe with stented vessel (white arrow) and adjacent coil mass (white arrowhead). The gradient echo image (B) shows signal intensity loss from susceptibility effects of the coil mass (blooming, white arrow), but no visible effects from the stent. Field mapping (C) shows no apparent field distortion related to the stent or the coil mass. The concentric lines represent magnetic field-strength lines with a difference of 50 Hz between lines. Nitinol is a unique metal alloy with a growing number of medical device applications. Several properties that account for its increasing use are its shape memory, biocompatibility, and kink resistance (10). Nitinol is also generally considered to be MR compatible; however, it is important to establish the safety of metallic implants in the MR environment. Some devices once previously thought to have no ferromagnetic potential have been found to possess some qualities of ferrous metals (7). Explanations for this phenomenon have included the metallurgical composition of different alloys, the degree of cold working during the manufacturing process (6), heat treatment (annealing), and other undetermined factors such as resterilization (8). Theoretically, a current may be induced in an electrical conductor as the magnetic and radio-frequency field gradients are applied, or as the conductor moves through the static field’s fringe region outside the imager. Also, a circuit with variable resistance created by the stent and adjacent coils may lead to heating. No evidence of heating was found with movement into and out of the MR scanner. 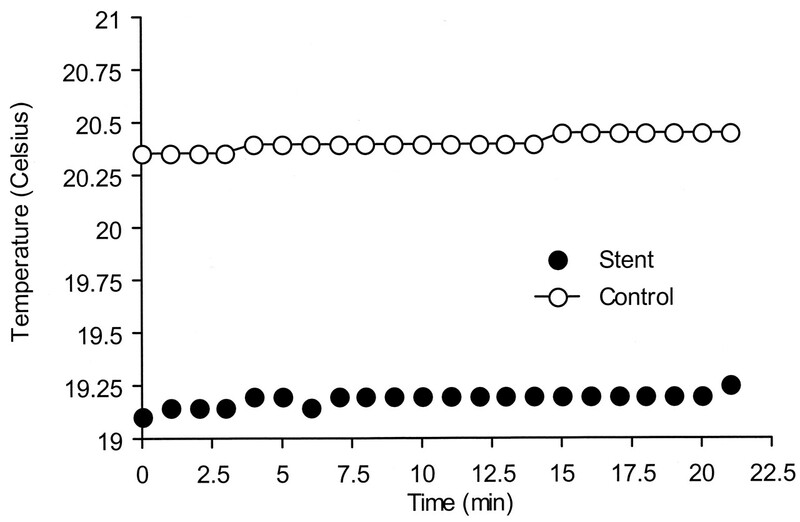 A minimal and similar increase in temperature in both stent and control syringes was found by using the maximal allowable radio-frequency energy sequence. It is possible, but unlikely, that other configurations of stent and coils not tested in the present study could create such a circuit and lead to heating. No deflection was observed. We found no evidence for heating or deflection of the Neuroform stent in a comprehensive series of in vitro experiments at 3T. MR imaging at field strengths up to 3T of patients with implanted Neuroform stents is safe. Imaging artifacts are minimal. The Neuroform stents and financial support for MR image time were provided by Boston Scientific Corporation/Target Therapeutics. Accepted after revision March 31, 2004.